Intrepid Control Systems » VividCAN VividCAN | Intrepid Control Systems, Inc.
Intrepid’s VividCAN is a versatile CAN tool with a customizable, full-color capacitive touchscreen. With the VividCAN you can create your own field service tool or driver’s aid, or create a customized display tailored to engineers, managers or hobbyists. The touchscreen can be customized by creating a Vehicle Spy Graphical Panel and downloading it into the VividCAN. The Graphical Panels and their controls are visible on the VividCAN screen. You can also display live CAN signal values. Additional functions – such as diagnostics, message decoding, and message transmitting – can also be included. The VividCAN supports at least eight graphical panels. 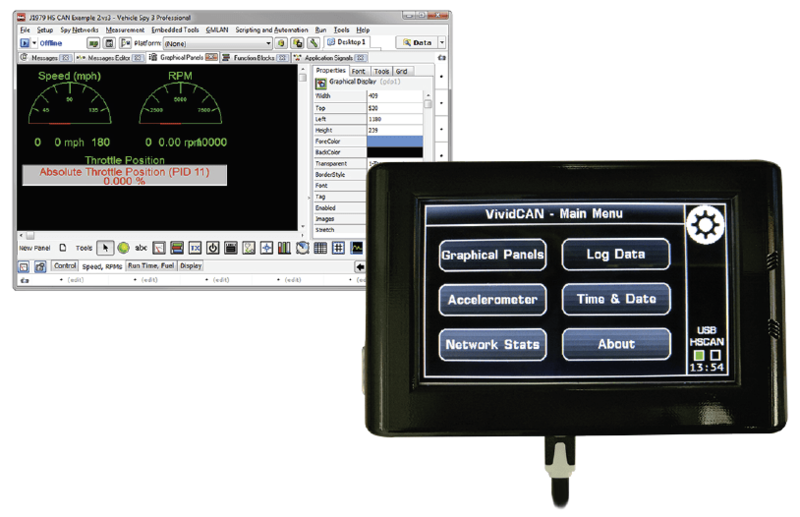 Using Vehicle Spy you can create a custom display interface for the VividCAN. The Log Data Function Block allows for a list of strings to be displayed containing CAN message signal data. Graphical Panels can be ported from your Vehicle Spy setup right to the VividCAN screen! Choose from a subset of controls: Text, LED, Bargraph, Gauge, Start/Stop Buttons, Tx Buttons, and more. The controls and layout will be recreated on the smaller screen of the VividCAN. Now you can bring your VSpy setup with you in the car, with the low-cost, fast-booting VividCAN! The color display works with our customizable CoreMini scripting engine to run Graphical Panels and scripts standalone on the VividCAN, giving you access to Vehicle Spy’s advanced operations when you take the VividCAN in the car with you. 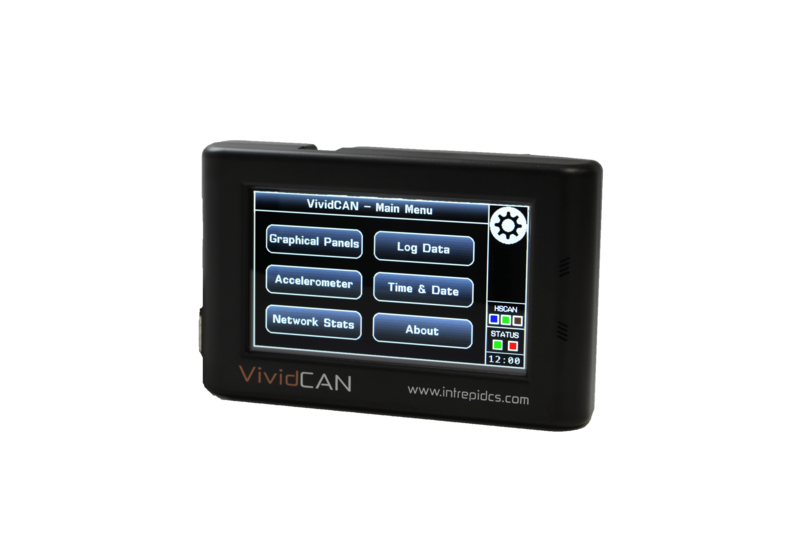 The VividCAN can also be used as a bench tool, enabling you to transmit and receive live on the CAN network without using a PC. The device includes CAN switch support, allowing it to be configured to use HS CAN, LSFT CAN or SW CAN. Because the VividCAN runs without an operating system, the device starts up in firmware and even loads a CoreMini in less than one second. No more waiting for an expensive tool to start up while your CAN network already has messages being sent! The VividCAN has a large internal flash memory that stores device settings and applies them at boot time. Parameters such as LCD brightness, color theme and the last viewed page are saved automatically. The next time the VividCAN boots up, it will pick up right where you were when you last used the device.